Bedrooms: 6 "2 in lodge, 4 cabins"
Bathrooms: 2 "I1 in main house and bath"
Size: 1,840 sq. 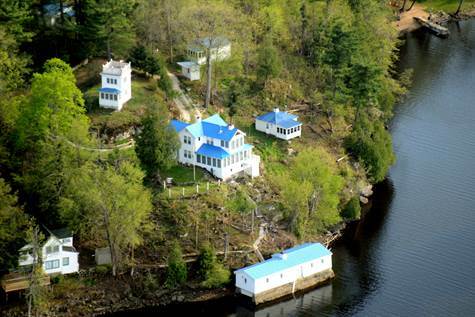 ft. "For the main lodge"
26 Greystone Lane, circa 1925, is an exclusive hillside retreat on 11+ acres overlooking the narrows of southern Black Lake in St Lawrence County. This family compound consists of a sun-filled main house, 4 sleeping cottages with enclosed porches, a bath house, the original boat house and a storage barn. The main lodge is a 2 story open design with windows looking at three different magnificent views of Black Lake. It has a natural wood interior, white tile floors, a stone fireplace, an open stairway and a kitchen with tile counter tops. This turnkey lake home has been copiously re-crafted with attention to detail, comfort and simplicity. Winding driveways connect the buildings and walking paths make enjoying the sloping grounds more feasible rendering the feeling of an old-world bygone era. An overwhelming sense of peace and privacy prevail. This meticulously maintained property is turnkey. The unique furnishings, an eclectic array of household accessories, lawn tools/equipment/ vehicles, and dock are all included. Just pack your bags and start making memories. Black Lake is truly unique being approximately 19 miles long and 4 miles at its widest point. It has over 60 miles of diverse shoreline in addition to its many islands. Because it has no industry on its shore, the water quality is so good that Black Lake has no fish consumption advisories. Boating enthusiasts can travel up the Indian River to historic Rossie or downstream to the Eel Weir Dam on the Oswegatchie River. Commonly known as A Freshwater Fisherman's Paradise, it boasts small mouth bass, large-mouth bass, crappie, walleye, northern pike, perch, bluegills, catfish and an occasional Muskie. 26 Greystone Lane is 22 miles from the Ogdensburg International Airport. It is 48 miles from the Watertown International Airport; 83 miles to Ottawa, ON; 140 miles to Montreal; 30 minutes to Alexandria Bay; and 105 miles to Saranac Lake. ▪ 83 miles to Ottawa, ON; 140 miles to Montreal; 30 minutes to Alexandria Bay; and 105 miles to Saranac Lake. ▪ 22 miles from the Ogdensburg International Airport; 48 miles from the Watertown International Airport; 17 miles from Hendrick Field, Gouverneur.